Note: A Brand/Issue combination needs to have at least one Category set up. If no Category is available, reporting will give unexpected results and the deadline functionality will not work properly. For periodic Brands (such as magazines and newspapers), Categories are created on the Brand Maintenance page. For project-oriented Brands (typically used by book publishers and advertising agencies), Categories are created on the Issue Maintenance page. 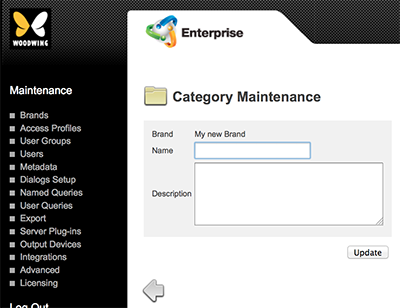 For periodic Brands: access the Brand Maintenance page for the Brand in which you want to add Categories. Step 1a. In the Maintenance menu or on the Home page, click Brands. The Brands page appears. Step 1b. Click the name of the Brand. The Brand Maintenance page appears. For project-oriented Brands: access the Issue Maintenance page for the Issue in which you want to add Categories. Step 1c. Click the name of the Publication Channel in which the Issue is located. The Publication Channel Maintenance page appears. Step 1d. For the Issue that needs to be edited, click the Edit button. Step 2. Locate the Category options. The Category Maintenance page appears. Step 4. Fill out the details. Name. Name of the Category. Description. Description of the Category. Pages. (Only available on the Issue Maintenance page). This feature is currently not functional. Depending on where you started, either the Brand Maintenance page appears or the Issue Maintenance page appears.